Today we have another one of those jobs you probably didn’t even know existed: Master Penman. Yes, a professional penman. 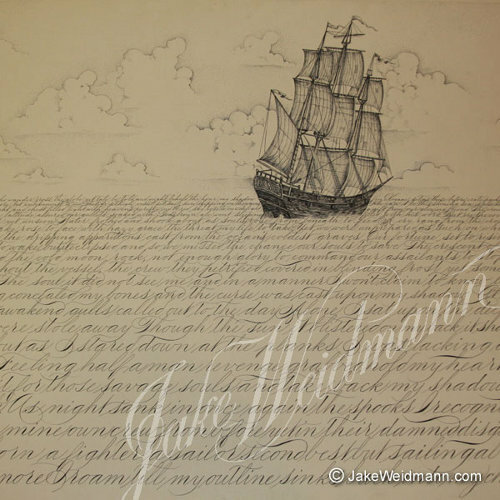 In this fascinating interview, Master Penman Jake Weidmann shares the story behind this historic job and title (one that only 11 people currently hold) and how he found his way into it. Made me kind of ashamed of, and want to work on, my own penmanship! I live and work in the beautiful state of Colorado. I have grown up here and apart from spending most of my college career in California at Biola University, I have always resided here in the south Denver region. I love Colorado for the grandeur of the landscape and the moderate, yet active lifestyle of its occupants. It has been a great inspiration to my work as I look out to see the front range of the Rocky Mountains from my studio window. I am following the biblical principle: “bloom where you are planted” and I am finding Colorado a fine place to bloom as an artist. 2. What does a penman do? And what makes you a “master” penman? A penman is a vintage title that was given to someone whose career and professional skill sets were in the area of penmanship of various types. Art colleges were set up around the country to train men and women in the many disciplines of penmanship and hand-drawn letterforms. Before the typewriter, this was a booming career path, as nearly every major business needed a competent and proficient penman on hand to manage log books, keep records, write policies, and execute certificates. Many penman would become itinerate teachers of handwriting in grade schools around the country, teaching the fine art of writing to children eager to express themselves in written form. A Master penman was one who was regarded by his friends and colleagues as the most proficient and prolific wielder of the pen. Such masters included Platt Rogers Spencer, who created the first American style of penmanship — the so-named, “Spencerian script,” Louis Moderasz, who was regarded as the greatest ornamental penman who ever lived and is credited with formulating the script that the Coca-Cola logo is written in, and Francis Courtney who was regarded as the “pen wizard” because of the “magic” created at the tip of his pen. During the golden age of penmanship (roughly 1860 to 1930) there were several of these masters living and working around the nation. Today, there are only eleven of us who bear this title. 3. Why did you want to become a penman? When did you know it was what you wanted to do? I was always fascinated by handwriting as a child. My mother had beautiful cursive and I loved the fluid linking of the letters into one another and the way they looked when they filled a page. As I identified myself as an artist during childhood, I made a personal vow that every time I put pen or pencil to paper, the result had to be a thing of beauty. So, I developed my handwriting incessantly all the way up through college. Anyone that saw it would take notice and almost always comment. I started getting requests from my fellow students in class for tattoo designs and wedding invitations; my professors knew me as the kid who wrote his essay tests like the Declaration of Independence. And so, I decided that I was going to research the old style of writing and figure out the traditional techniques for executing script, even if I had to start writing with a quill. One fateful day in my dorm room, I searched YouTube for a video on “copperplate script”– lo and behold I found a video of Master Penman John DeCollibus writing the most beautiful script I had ever seen. It was like watching ballet on paper and from that moment I was hooked. From there my research grew and I found the International Association of Master Penman, Engrossers and Teachers of Handwriting, or IAMPETH for short. 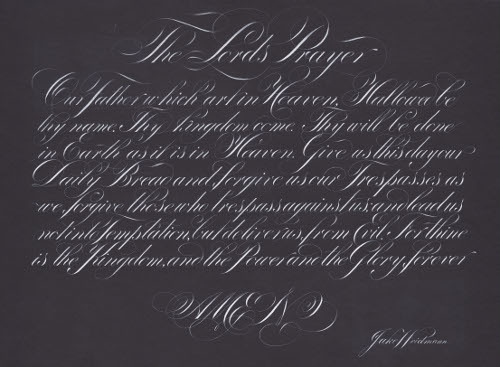 On IAMPETH’s website, I learned of the rich history of American heritage handwriting and what it meant to be a “Master Penman.” Immediately, I knew it was something I wanted to pursue. 4. 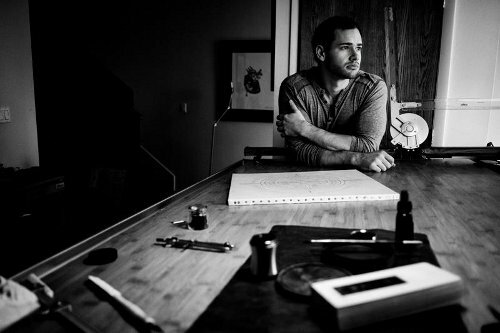 How do you become a Master Penman? Is it something you can go to school for? Do you apprentice under someone else? The road to becoming a Master Penman was a long and arduous one…and I relished every second of it. There are no longer schools for penmanship, so like all the other art forms I had learned before it, I had to teach myself. The learning curve was an awkward one, with a rollercoaster of peaks and valleys rather than a general ascent. Frustrated with the poor and few tools available, I started making my own pens on a lathe. I would practice tirelessly with them to obtain the muscle memory required to execute the perfect letter forms and exquisite flourishes. My sudden appearance on the calligraphy scene got me noticed quickly. I attended the conferences that IAMPETH put on once a year and I would learn anything anyone was willing to teach me. I was welcomed by the skilled hands of willing teachers. My pens caught their notice too and to this day I have sold several hundred of my pens worldwide. 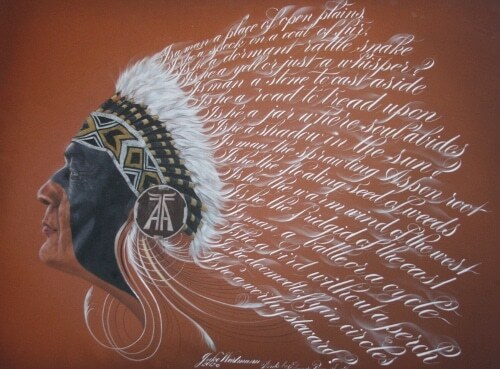 As my work grew in volume and skill, the existing masters took notice and in 2010 I was nominated by the calligrapher to the White House, Rick Muffler, into the Master Penman program. From there I entered into an apprenticeship underneath him in pursuit of my Master’s certificate. The final stage of the program requires you to make your own certificate as the best of your work to that point. 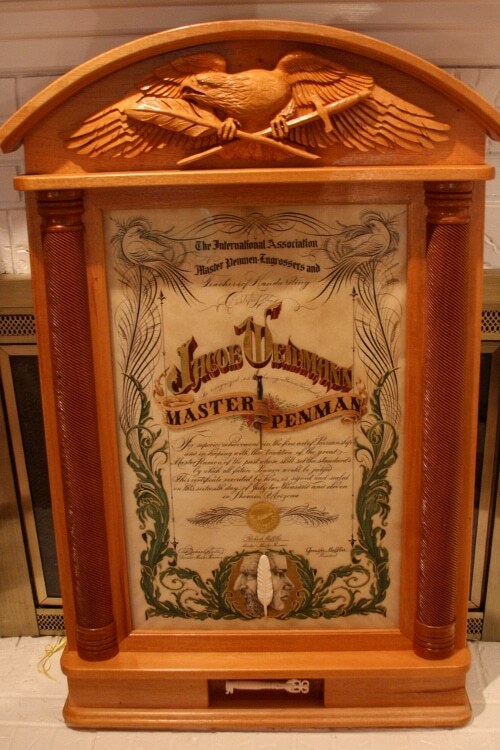 On July 16th, 2011, I received my Master Penman’s certificate, which I executed on calfskin vellum with a pen I forged out of antique ivory and in a frame I carved out of Honduran Mahogany — truly the apex of my work thus far! 5. What job opportunities are out there for penmen? What kinds of things do you get hired to do, and who are you clients? There are various jobs penmen are asked to do; the most common is invitation work and certificates, but there are a wide variety of special commissioned works that the Masters are asked to do. Many penmen do work for very high-end clients such as celebrities, the President, and even the Pope. The work that I do now lives in the realm of fine art. Because of the many different mediums in which I work, I do all kinds of art for an array of clientele. Everything from designing lettering pieces, painting murals, creating original works to be sold in limited edition prints, and carving in wood, bone, and antler. The best part of my job is being able to do what I love and see the work of my hands take solid shape in front of me. There is no greater adventure or better thrill than working real material into something that it could never be without my influence on it. 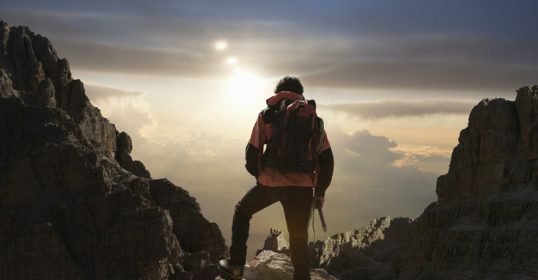 A man wants to know that his life and his work will count for something — that his existence has tangible impact on his environment. Art is my impact and I am spoiled by its immediate effect. Like any other job, mine has its dull aspects. I have inventory to keep track of, orders to fill, taxes to file, bills to pay, and emails to answer. In the midst of the magic that is creating art, I have reality to deal with. Being a professional artist means that I have to live fully in both the art and business worlds. What I create in my studio may be sacred, but once it leaves the door it is a product — I am learning to deal with this duality. Artists are notorious for being poor business people, and I do not want the same to be true of me; I wrestle with it constantly, but I am determined to be good at both. At this stage in my career, balance is very hard to maintain. I can quickly get buried in my art and forget the ones that I love. I have to tell myself that people always come first. When art separates me from my relationships rather than bringing me into them, then I know that I am out of balance. Of course art requires much time spent away from others in order to accomplish what I need to, but isolation is only good for so long. When I spend time in the company of others and talk about my work with them, I often have moments of epiphany that speak into my work. To combat this, I keep interests in other things outside of my home studio, like natural bodybuilding. Pumping iron is a polar opposite of writing calligraphy and I have found it as the perfect daily discipline to pull me out of my art. And when I have a healthier balance in my life, my art is all the better because of it; I am able to return to my work with a renewed perspective and greater motivation and focus than before. The biggest misconception people have about my work is that they assume I am doing it all on the computer. Because we live in a modern world of technology, the fact that I am doing everything by hand is almost a foreign concept. 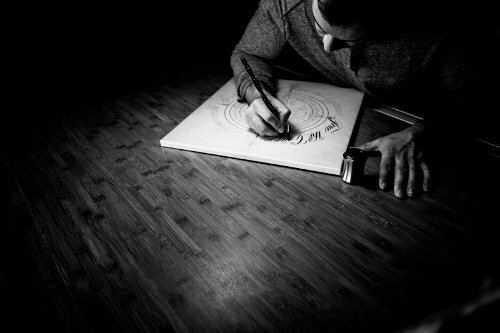 I get inquiries from other designers who ask me what programs I use to create my pieces, and especially my calligraphy. While I am flattered that people perceive my accuracy on level with a computer, I need to do a better job of explaining the “human factor” in my art. I am not a minimalist and I do not have a personal vendetta against technology, but I have found that the hand is still the greatest romancer of the eye. 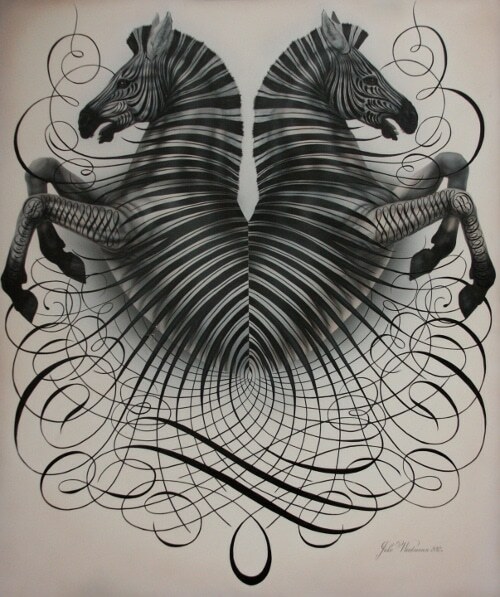 Though the average person would not be able to pick out the imperfections within a well-executed piece of art or calligraphy, the eye recognizes it as a result of the hand and is attracted to what they both have in common: the human element. I’ll leave you with two pieces of advice: Choose to struggle with something — we live in a culture of the quick and easy and it has made us impatient and lazy. When you commit to something that takes work and see it through to the end, it will develop you as much as you develop it. Second, invest in art — I am not just suggesting my art, but any art that you like. We are a society that looks at everything and beholds nothing. Good art is something to behold and will bring you a sense of peace and stillness in a world in constant motion.